ALISO VIEJO, Calif. (JANUARY 2, 2014) – Tickets are now being sold for SIMA Image Awards, the highly anticipated awards ceremony that will honor the best of the surf industry from 2013. The event will take place Thursday, February 13, 2014, at The Grove Theater in Anaheim, CA with doors opening at 7:30 P.M. The night will be hosted by multi-media action sports personalities Chris Cote and Nicole Dabeau, and is open to both the industry and public. 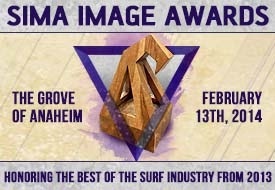 The Surf Industry Manufacturers Association (SIMA) announced the 2013 SIMA Image Award final nominees in November 2013 – the February ceremony will be when the winners of each category are first revealed. Tickets will be sold on a first-come, first-served basis. Tables of 12 are on sale for $900 and include 12 tickets and a reserved table in the premier seating area. Tables of six are on sale for $500 and include six tickets and a reserved table in the premier seating area. General Admission ticketsare also available at $25 per person. Tickets are required for entry into the event and lost tickets will not be refunded. The deadline to secure reserved tables is February 7, 2014. There will be no refunds after February 7, 2014. For more information or to purchase tickets, please visit www.regonline.com/simaimageawards. For questions, please contact SIMA EventManager, Kelly Keenan at Kelly@sima.com or 949.366.1164 x3. In its eleventh year, the goal of the SIMA Image Awards is to identify the surf industry’s most influential companies and recognize them for their efforts to advance and grow the industry over the past year. For complete details on the nomination and voting process, as well as the complete list of nominees, visit www.simaimageawards.com. The Surf Industry Manufacturers Association (SIMA) is the official working trade association of more than 300 surf industry suppliers. Founded in 1989, SIMA is a non-profit organization that serves to promote awareness of the surf industry and participation in the sport of surfing through public relations efforts and a variety of services, educational programs and research. In addition, SIMA actively supports oceanic environmental efforts through its 501(c)(3) charitable environmental foundation, the SIMA Environmental Fund. In the past 24 years, SIMA's Environmental Fund has raised more than $6.2 million for environmental groups seeking to protect the world's oceans, beaches and waves. The SIMA Humanitarian Fund, also a 501(c)(3) charitable foundation, was established to award grants to various surf or boardsport related social and humanitarian non-profit organizations whose efforts are focused on improving the quality of life, health and/or welfare of people. Since 2004 the SIMA Humanitarian Fund has raised and donated more than $1.58 million to surf-related non-profit humanitarian organizations. For more information regarding SIMA, please visit www.sima.com. Follow SIMA at Twitter.com/SIMA_SURF.